Physical Characteristics: Have a 28 – 40 inch body length, a wingspan of 5 – 7 feet, and weigh 5 – 15 pounds. Head and wedge-shaped plumage are white, with a yellow beak and feet. Legs are feather-free, toes are short with large talons. Talon on the hind toe is a cunning evolution, designed to fatally pierce prey while held immobile with front toes. Plumage of immature bald eagles is brown speckled and white, which it retains until reaching sexual maturity. In flight, can reach speeds of 40 – 50 mph, with a dive speed of 100 mph. Diet: Opportunistic feeders, with a diet largely made up of fish, specifically trout and salmon in the Pacific Northwest. Rely on scavenging carrion, especially in winter – from small mammals to ungulates. Mammalian prey includes rabbits, raccoons, muskrats, beavers, and deer fawns. Birds and amphibians also preyed on. Habitat: Prefer large bodies of water. Need old-growth/mature conifer and hardwood trees for nesting, perching, and roosting. Selected trees must have good visibility, open structure, and proximity to prey. Abundance of comparatively large trees surrounding the body of water is also important. Extremely sensitive to human activity, and usually found no less than one mile away from low-density human disturbance. Range: Natural range covers most of North America. Partially migratory, depending on location and availability of food. May congregate in certain locations in winter (such as a river) where salmon are spawning. Have been known to inhabit the Meadow Creek and John Day areas. 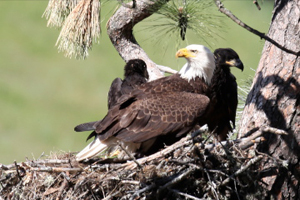 Reproduction: Bald eagles often return to birth place. It is thought that pairs breed for life, though if one dies or a pair fails to reproduce after several attempts they may split and look for new mates. Mating is a flight display including swoops, cartwheels, chases, and locking talons to dive dizzyingly, letting go at the last moment to avoid hitting the ground. Mating season is anywhere from late September to early April; the female lays her first egg 5-10 days after mating. Both male and female help build nest out of branches. There are 1-3 eggs in a clutch, which incubate for approximately 35 days. Parents take turns incubating, hunting, and looking for nesting material. Average lifespan is twenty years. Threats: Estimated that in the 1700s, bald eagle numbered 300,000 – 500,000. By late 20th century they teetered on brink of extirpation in lower United States, with total breeding pairs estimated at 500. This was partly due to widespread use of pesticide DDT, which weakened eggshells so much they would crush under weight of adult eagles. Populations have since recovered, though poaching, habitat loss, and poisoning from ingesting lead shot remain threats. Eagles have been successfully delisted from the Endangered Species Act. Miscellaneous: Size and age varies with location, following an eco-geographic rule asserting that species size increases positively with distance from equator. For example, the smallest bald eagle specimens are found in Florida, where they may be less than half the length and weight of largest specimens found in Alaska. Interestingly, females are consistently 25 percent larger than males. Before the bald eagle was the iconic symbol of the United States federal government, it has long figured prominently in some Native American cultures. Its feathers and talons are central to many spiritual and religious customs, and the birds themselves considered spiritual messengers between humanity and god or gods in some cultures.